We made this card at Convention this year. I think this is going to be one of my favorite stamp sets! We used a circle template made with the Big Shot and Circle's #2 die and sponged color into the circle, then stamped the image and greeting. One of the traditions of Convention is making gifts for those who attend Convention with you (especially your downline). This year, two of my fabulous Sparklers - Gloria and Nancy - attended with me. Along with the Bag Tag and posted several days ago, I made these altered note books for them. I used Pear Pizazz card stock and In Color Prints DSP on Gloria's and Poppy Parade, Daffodil Delight and Sunny Garden DSP on Nancy's. I die cut their initials with the Serif Essentials alphabet and the Big Shot. This cute little pouch can be used for lots of little goodies tucked inside it. We made 6 of these tiny cards to put in a cello bag. This project features the Just Believe stamp set, Pear Pizazz, Daffodil Delight and Pumpkin Pie inks and cardstock. From today through August 31, Hostesses can earn an additional $25 in FREE product! Simply host a workshop or a book party totaling $350 or more! I still have available dates in August! I'm sitting in the hospital surgery waiting room with my dad. We've spoken with the physicians who operated on my mom and she has been taken to recovery. We are all breathing a huge sigh of relief - the surgery went well and no further treatment is expected! So thank you for all of your prayers and good wishes! While we have been waiting, I was scrolling through my hundreds of photos from Convention and came across the photos of the projects we made so thought I would take the opportunity to post. Supplies used: Not Quite Navy and Bashful Blue card stock; watercolor paper; Old Olive, Pear Pizazz, Not Quite Navy and Bashful Blue markers; Old Olive Satin Ribbon, Button. Color the stamp with markers and lightly spritz with water. Stamp onto watercolor paper. Allow to dry. Stamp greeting, tear watercolor paper and Bashful Blue card stock as shown. Adhere ribbon and button to bottom and then adhere this piece to Not Quite Navy card. Stamp envelope. This quick and easy scrap book page was made with the Newsprint DSP. I used the "The Story" sheet and trimmed it down a bit and mounted it on a sheet of 12" x 12" Basic Black card stock and mounted the photos on Basic Black card stock as well. The Hydrangea is from the Level 1 Hostess set Because I Care. One of the new punches in the Idea Book and Catalog is this Owl Punch. Isn't he cute? Angie made this owl card for our Open House Display board. I liked him so much I CASE'd him for our Convention bag tags. Supplies: Baja Breeze, Chocolate Chip, Very Vanilla card stock; 2 Step Owl Punch, 2 Step Bird Punch, Ribbon Border punch; Chocolate Chip Classic Ink and Elegant Soiree DSP. Speaking of Convention, this is the last day. It's hard to believe! It always goes by so fast! I'll post the make and takes during the next week. One of our projects this month was making a note card set. The first photo is the note card holder using Pear Pizazz card stock and ribbon and Greenhouse Gala DSP. We colored the images of the stamps with markers. 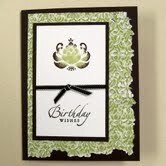 We filled the note card holder with four stamped noted cards and envelopes (sold in a set of 20 for $5.95). We trimmed 1/4" off of the front of the card and adhered a strip of the DSP to the inside so it peeks out. Last night we attended the Power Flower Party at Convention! We always have a great time and this was no exception! We were told to wear our best flowers so we decided to do a flower swap. 18 of us made wearable flowers of some kind - pins, rings, bracelets. The first photo is my swap. These were really easy to make! You will need to use a polyester fabric of some kind (I used a polyester satin). Die cut circles with the Circles #2 Sizzix Die. There are 4 different sizes of circles. I used 2 of each size and layered them. I used our Rhinestone brads for the center (hint: put the brad through each layer - it's easier, especially with more slippery fabrics). Spread the wings of the brad. Using your heat tool, heat up the circles until they start to curl. You will need to play around with how much you want the flowers to curl up. Please be careful - these will get hot! Use something to hold the flower down on the table. Each year our fearless leader, Kim, gives us a green hat that goes along with the theme of Convention. With the thousands of demonstrators that attend Convention, wearing a funky hat of some kind makes it easier to find each other! This year, our hats were the perfect place for pins! One of the stamping events I held last week was an Open House for new Idea Book & Catalog. We always make samples of new stamps and accessories to give you even more ideas. Angie made this sweet card with the new Aviary stamp set. How cute is this ?!?! Supplies used: Concord Crush (new In-Color) and Whisper White card stock; Lap of Luxury DSP; Word Window and Modern Label punches; Versamark and Gold Embossing Powder; Concord Crush and Marine Mist Classic Ink. The last couple of weeks have been painfully busy....my mom has been diagnosed with uterine cancer so we have had several doctor's appointments to begin the treatment process. (Please keep her in your prayers as she undergoes a hysterectomy later next week. Hopefully she will need minimum followup of any kind). Toss in a root canal for an abscessed molar, a couple of Stamping events and getting ready for Convention and time just flies.....(wah - wah - wha). But....here I am in Salt Lake City! We arrived this afternoon and check in starts tomorrow morning! I can't wait to share the things I will be learning with you! In the meantime, I took of photos of projects I have been working on so I am hoping to be back at posting more frequently!! I thought I would share my Convention swap card. I love that there are more "toys" in the new catalog to create vintage style projects! Supplies used: Soft Suede and Naturals Ivory card stock; Newsprint DSP; Vintage Vogue stamp set; Antique Brads and brass metallic brads; Crochet Lace Trim; Distressing Essentials kit; Vintage Wallpaper Embossing Folder & the Sizzix Big Shot. I just love all of the samples in the catalog! If you ever need inspiration, just open it up and start imagining what your project would look like using that idea! You can change the colors, the stamp set or both! Stampin' Up! encourages and inspires us by providing great reproducible projects! So have fun! I CASE'd the card on page 70 that uses the Fun & Fast Notes. I changed the colors to Pear Pizazz, Marine Mist & Daffodil Delight! We received this stamp set on the Cruise in May. I made this for our recent downline swap. The flower is embossed with Versamark and Black embossing powder and the smaller flowers are water colored with markers. This stamp set also coordinates well with the Itty Bitty Punch Pack and the new Petite Petals Jumbo Wheel. Supplies used: Poppy Parade, So Saffron, Basic Black & Very Vanilla card stock; Versamark and Basic Black ink pads; Black embossing powder; Pear Pizazz, Poppy Parade, So Saffron, Baha Breeze and Rich Razzleberry markers; Teeny Tiny Wishes. A good friend passed away and I was helping his wife (also a great friend) with whatever she needed. Barb how has to acclimate to a whole different lifestyle....please keep her in your prayers. I was also busy with end of the fiscal year kinds of things...end of one catalog and transitioning to new catalog (which is fabulous!!) along with earning the Cruise to Alaska!!! Yep!!! I made it - and on my birthday to boot!! My daughter, Julie also earned the trip so we are excited!!!! I have managed to get some (albeit limited) stamping time in. Today's project is the birthday card I made and sent to my son-in-law, Jim. Supplies used: Early Espresso, Pear Pizazz and Very Vanilla card stock; Greenhouse Gala designer series paper; Friends Never Fade & Sincere Salutations stamp set; Early Espresso and Pear Pizazz Classic Ink; Vintage Wallpaper Embossing Folder and the Sizzix Big Shot; Early Espresso 1/8" taffeta ribbon; sanding block. I ran a piece of designer series paper through the Vintage Wallpaper embossing folder and then used the sanding block to distress the piece and allowing the embossing to pop some white through the design. I used the Rock & Roll technique on the flower image.